Speed rivet with a repetition system suitable for applications in metal, plastic and aluminium alloys. Bralo BSR Rivet is synonymous of speed and efficiency. Bralo BSR Speed Rivets are designed for the fastening, in a fast and precise way, of all kinds of materials, metal or plastic, composites and electronic components. They are supplied in a strip of paper (loading system) and placed using a repetition system with a single mandrel. At the end of a riveting cycle, the next rivet is automatically fed in the tool nose-piece, ready to begin a new cycle. This is possible due to its bulging or pre-shaped end. 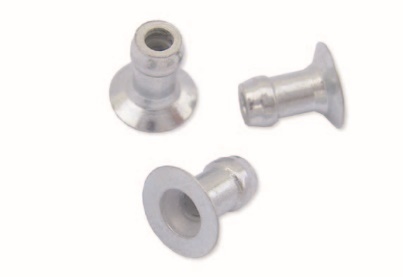 The result is a fastener element with a high torque capacity and a good resistance to shear strength. Fast and high precision assembly: the assembly cycle time does not exceed 2 seconds. It increases productivity: there are no interruptions and up to 60 rivets per minute can be placed. Diversity. It is available in a wide range of materials: aluminium, steel and stainless steel. Wide range of lengths and diameters. It does not deform surfaces after the riveting process is finished (painted, glazed surfaces etc.). Different materials, with different types of manufacturing can be fastened: composites, laminates, heat treated materials, etc. Conical end to facilitate the hole entry. It expands radially during installation to ensure the best hole fill. Having no mandrel means avoiding noises or short circuits resulting from residual portions of mandrels inside the body. They do not come loose from dynamic stress (vibrations in general). They can be fixed in applications with a single-side access and can be assembled from both ends. Their bulging or pre-shaped end provide a high torque value in the joint and a good resistance to shear strength. Materials: Aluminiium, Steel and Stainless Steel. Diameters: 3.2 mm., 4.0 mm. y 4.8 mm.